Feds.gov was a concept idea to launch a marketing and recruiting website for federal services. It needed to be attractive and highly engaging. While the website never moved beyond the design stage there were a few excellent design submissions from different designers. 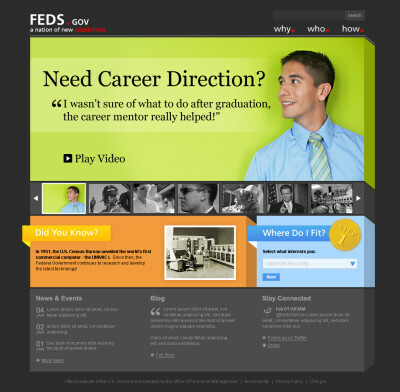 This particular design aims to portray Federal employment as a modern, slick, cool opportunity. In order to battle the old stigma of Federal employment, the design also proposes interesting facts in a mythbuster fashion.